Use of anti-ovine IL-8/CXCL8 monoclonal antibody (clone 2C9) in ELISA, western blot, and intracellular cytokine staining assays. Sean Wattegedera, Ann Percival and Gary Entrican, Moredun Research Institute (MRI), Edinburgh, UK. CXCL8 (also known as interleukin (IL)-8, monocyte-derived neutrophil chemotactic factor or neutrophil activating factor) was the first chemokine to be identified. It has a primary role in the recruitment and activation of neutrophils and other granulocytes to sites of infection and inflammation. The chemokine is produced by activated macrophages, monocytes, endothelial and various cell types at mucosal surfaces (Seow et al. 1994). In normal homeostatic environments, levels of CXCL8 are negligible but are up-regulated in response to pro-inflammatory cytokines such as TNF-α and IL-1β or to infection with bacterial pathogens such as Staphylococcus aureus and Escherichia coli (reviewed by: Liu et al. 2016, Gangur et al. 2002). CXCL8 can be found in a variety of biological fluids such as serum, plasma and urine and inside cells. It is therefore important to have a variety of techniques available to measure it. The 2C9 anti-ovine CXCL8 hybridoma has recently been developed at MRI. The antibody can be used in conjunction with other antibodies and reagents for a sandwich ELISA, western blot and intracellular staining. In order to assess an antibody for suitability in a particular application, validated defined positive and negative control samples and thorough wash steps are essential. Coat ELISA plate with 2C9 anti-ovine CXCL8 antibody at 2 μg/ml in carbonate buffer overnight. Perform blocking step. Next add a set of ELISA standards of known protein concentration (at least a range of eight to provide a large dynamic range for standard curve generation to enable quantification of low and high native samples) and the test samples. 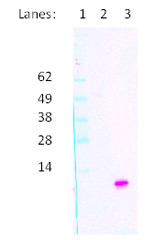 Follow with the detection rabbit anti-ovine CXCL8 polyclonal antibody (AHP425, Bio-Rad) at a 1:500 dilution. Next, amplification of the signal is required using streptavidin-horse radish peroxidase (streptavidin-HRP). Finally, add the appropriate ELISA substrate such as 3,3′,5,5′-Tetramethylbenzidine, allow to develop and then add stop solution (i.e. 0.1 M sulphuric acid) to terminate the reaction. Read plate on a spectrophotometer at 450 nm (Figure 1 a., b.). Fig. 1. 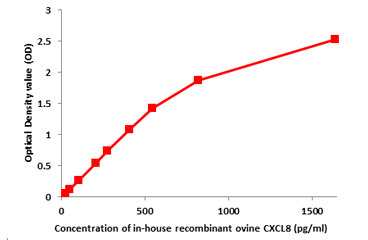 (a) Standard curve from the CXCL8 ELISA using mammalian-expressed recombinant ovine CXCL8 (in-house, MRI). There are a range of eight standards that provide a large dynamic range for standard curve generation to enable quantification of native samples containing low and high amounts of CXCL8. Fig. 1. 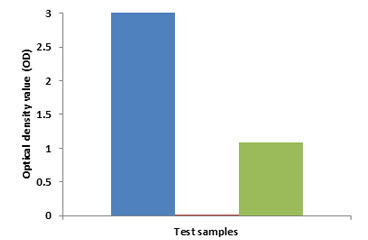 (b) Test samples containing native or recombinant ovine CXCL8. Blue bar: recombinant ovine CXCL8 expressed in bacteria (in-house, MRI). Red bar: culture supernatant from unstimulated ovine AH-1 trophoblast, no CXCL8 production detected. Green bar: culture supernatant from ovine AH-1 trophoblast stimulated with recombinant ovine TNF-α (in-house, MRI), high native CXCL8 production. Use defined positive and negative controls alongside test samples and pre-stained protein standards under reducing conditions in the gel. For the blot, add the primary antibody, anti-ovine CXCL8 antibody clone 2C9, at 1 μg/ml in 2% milk powder (w/v) in PBS/0.5M NaCl/ 0.5% Tween 80 for one hour. Add goat anti-mouse IgG streptavidin-HRP for signal amplification and incubate for 1 hr and substrate for visualization. Read using a chemiluminescence detection system (Figure 2). Lane 1: Pre-stained protein standards. Lane 2: Supernatant from unstimulated cells. Lane 3: Recombinant ovine CXCL8 expressed in bacteria, estimated 5 μg total protein. Good positive and negative controls are essential. There should be cells that give a reproducible high level of expression (transfected cells are ideal) and control cells that are negative for CXCL8. Cells must be permeabilized and blocked prior to incubation with the primary antibody. 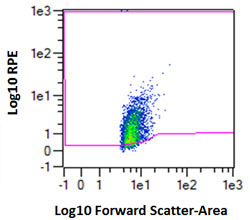 Use the 2C9 anti-ovine CXCL8 antibody at 1 μg/ml and an isotype control (equivalent of 1 μg/ml). Use a detection antibody such as a goat anti-mouse R-phycoerythrin (RPE). Cells should be fixed if there is a delay between staining and acquisition (Figure 3). Fig. 3. Recombinant ovine CXCL8-expressing transfectant CHO cells are detected by intracellular flow cytometry. 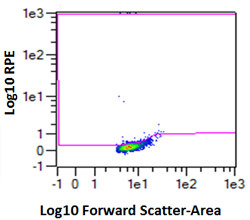 Fixed control CHO (UTF) cells labeled with (i) anti-ovine CXCL8 antibody clone 2C9 and goat anti-mouse IgG-RPE (ii) isotype control antibody (in-house, MRI) and goat anti-mouse IgG-RPE. 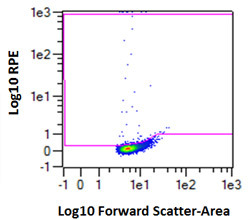 Recombinant ovine CXCL8-expressing transfectant CHO cells labeled with (i) anti-ovine CXCL8 antibody clone 2C9 and goat anti-mouse IgG-RPE (ii) isotype control antibody and goat anti-mouse IgG-RPE. Gangur V et al. (2002). Chemokines in health and disease. Vet Immunol and Immunopathol 86, 127-136. Liu Q et al. (2016). 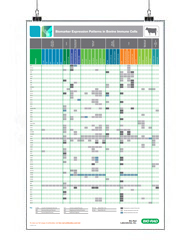 The CXCL8-CXCR1/2 pathways in cancer. Cytokine Growth Factor Rev 31:, 61-71. Seow HF et al. (1994). Cloning, sequencing, expression and inflammatory activity in skin of ovine interleukin-8. Immunol and Cell Biol 72, 5, 398-405. This work was conducted jointly at the Moredun Research Institute and The Roslin Institute at the University of Edinburgh as part of the Biotechnology and Biological Sciences Research Council (BBSRC) Industrial Partnership Award ‘The route to identification of immunological correlates of protection in ruminants’ (grant numbers BB/I019863/1; BB/I020519/1). Sean Wattegedera, Ann Percival and Gary Entrican were also funded by the Scottish Government Rural and Environment Science and Analytical Services (RESAS). To support your research, whether for improved animal welfare or investigating aspects of sheep immunology, Bio-Rad supplies a range of antibodies against cell markers and cytokines to investigate the ovine immune system.